After months of keeping it a top secret, we are so excited to finally pleased to announce that we have a brand new adhesives brand coming this summer… Dot & Dab! 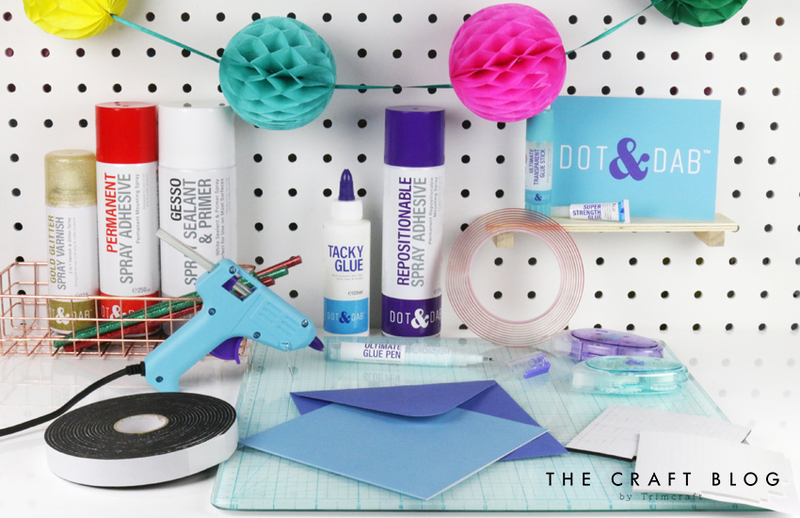 Dot & Dab has been designed by crafters, for crafters! We understand the need to create projects that really stick, so we’ve designed and developed a range of adhesives to suit a variety of applications, from general arts and crafts to DIY projects. Whether it’s multi-purpose or specialist adhesives that you need, Dot & Dab aim to provide a high-strength bond. From super strength and everyday all-purpose glue, to a heated glue gun range, discover the right adhesive for a multitude of projects and activities. With Dot & Dab, find strong and versatile adhesives that can stick with ease to a range of surfaces, for a professional-looking project every time. … as well as our Ultimate Glue Sticks and Ultimate Glue Pen for all of your general arts and crafts needs! We really do have something for every project! What do you think to this selection from Dot & Dab? Have you spotted something that will be super useful for your projects? Don’t forget to let us know by dropping us a comment below! Really excited to see a professional range of adhesives! Can't wait to try these out! What a comprehensive range, look forward to trying them. Where can we buy it please?